By Barbara Dubbeldam, October 16, 2018 at 11:34 am . 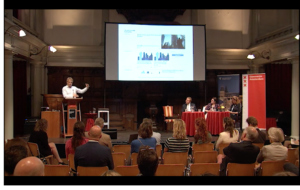 In May 2018 the Institute of Network Cultures co-organized the Flying Money Conference together with the city of Amsterdam. This European conference had a unique nature and scope. It brought people together from a wide range of backgrounds – civil servants, scientists, engineers, journalists, artists, bankers and entrepreneurs – to discuss topics related to the future of digital money, and illicit financial flows in particular. To address these themes more than 40 speakers were invited, including Bill Browder, Eric Smit, Francesca Bria, Bastian Obermayer, Klaas Knot, Misha Glenny, Joris Luyendijk, Saskia Sassen and Galia Benartzi.